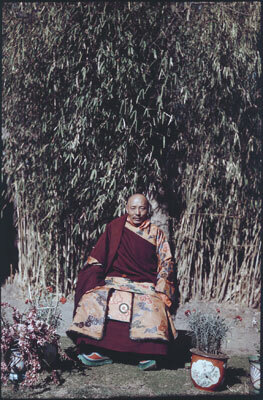 Nechung oracle, Lobsang Namgyal, seated on a chair in a bamboo grove at his monastery. There are flower pots on the ground beside him. Manual Catalogues - Typewritten handlist entitled 'Hugh Richardson Collection, The British Museum. Photographs taken between 1936-50. Cameras: Zeiss Super Ikonta, Reflex Korelle. 300 colour slides (Dufay colour); copies made Jan. 1995. The Tibet Album. "Nechung oracle, Lobsang Namgyal, at Nechung" 05 Dec. 2006. The British Museum. <http://tibet.prm.ox.ac.uk/photo_BMR.6.8.52.html>.